As you can see in the example above, the name of the transcript (AT2G01210.1) and gene (AT2G01210) is provided in the fasta heading to allow the identification of correctly and incorrectly mapped reads. The first step was to generate read sets with a reads length of 50, 100 and 200 bp in length, align and count the mapped reads with featureCounts using a mapQ threshold of 10. The results show that STAR produced the highest correct mapping rates at 50 and 100 bp; while at 200bp, SubJunc showed slightly better correct mapping rates. 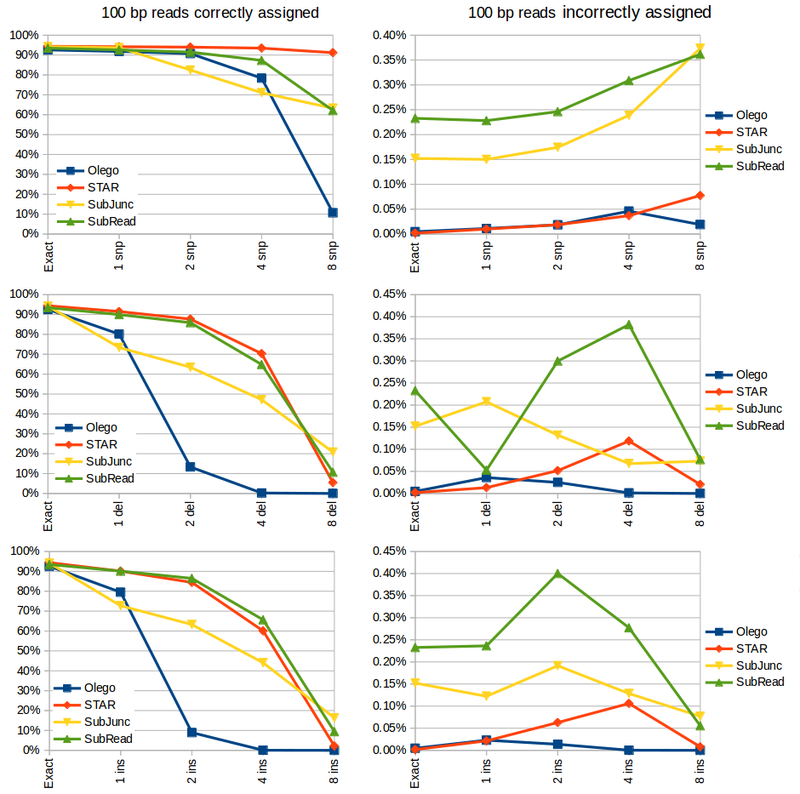 SubRead showed the higher incorrect mapping rate potentially as it is not optimised for spliced read alignment, but SubJunc was not much better. STAR showed the lowest incorrect mapping rates across all read lengths. The next step was to incorporate mutations into the sequences, which I did with msbar utility, which is part of the EMBOSS suite. Fig1. 50 bp reads with single nucleotide changes (upper panels), deletions (centre panels) and insertions (lower panels). Left hand side shows correctly mapped reads and Right hand side panels show the rate of incorrect read mapping at mapQ=10. Fig2. 100 bp reads with single nucleotide changes (upper panels), deletions (centre panels) and insertions (lower panels). Left hand side shows correctly mapped reads and Right hand side panels show the rate of incorrect read mapping at mapQ=10. 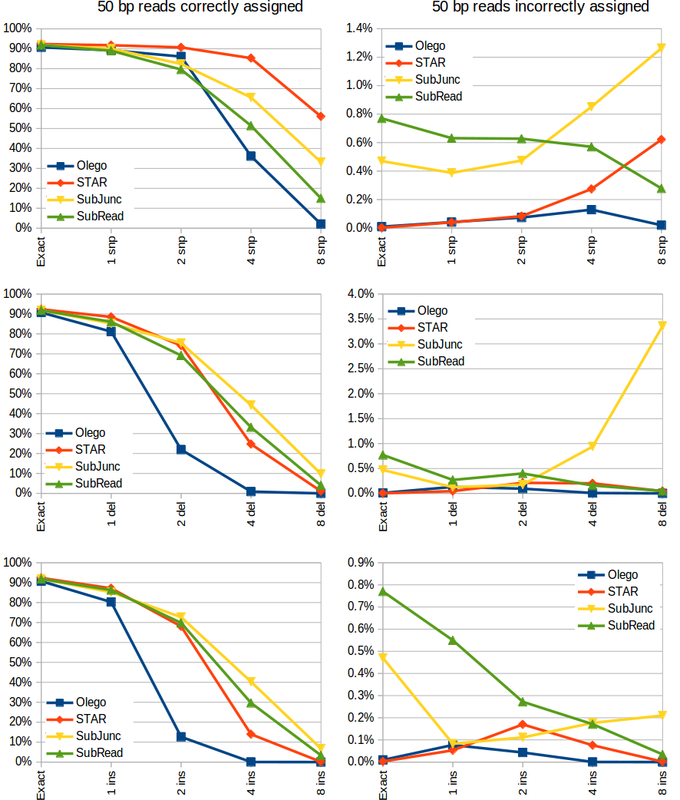 These data show that when single nucleotide changes are incorporated, STAR aligner clearly performs better in identifying the most correct alignments while limiting incorrect read alignments to low levels. STAR, SubRead and SubJunc show similar proportions of correctly mapped reads with increasing insertions, however SubRead and SubJunc showed the highest proportion of incorrectly mapped reads. STAR showed the best correct mapping rate and lowest error rate with exact reads and reads containing single base mismatches. STAR also performed robustly when dealing with indel-containing reads. 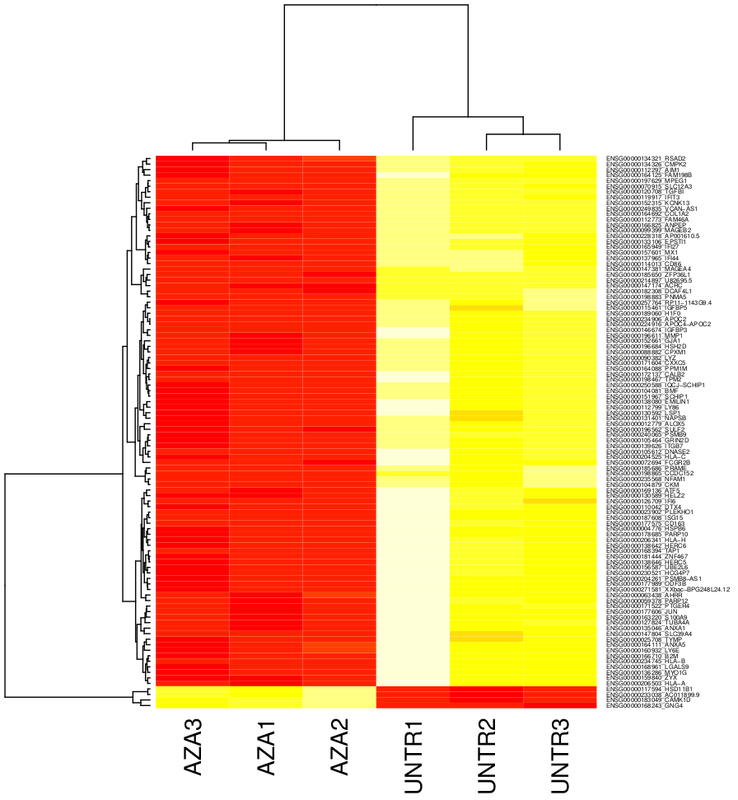 Thus I would recommend STAR for all 50-200 bp single end RNA-seq analyses. SubJunc and SubRead showed relatively high incorrect assignment rates, and I would suggest using more strict mapQ thresholds for these aligners if you need to use them. split --additional-suffix=.split -l 1000 tmp1 tmp.